1. Preheat the oven to 150˚C, gas mark 2. Line the base and sides of a 23cm springform cake tin with baking parchment. In a large bowl, use a balloon whisk to mix together the ricotta, cream, eggs, flour, vanilla extract, sugar, cinnamon, a pinch of salt and 3 tbsp honey. 2. Pour into the prepared tin and bake in the centre of the oven for 50-55 minutes, until the cake is light golden and just firm in the centre when jiggled. Leave to cool in the tin on a wire rack. It will sink slightly as it cools. Cover and chill for 2-3 hours. 3. Meanwhile, increase the oven to 170˚C, gas mark 3. Put the apricot halves in a baking dish, cut-side up, and drizzle with the remaining 5 tbsp honey. Cover loosely with foil and bake for 25-30 minutes, until soft, but still holding their shape. Add the orange blossom water, if using, and set aside to cool, then chill until needed. 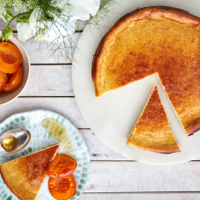 Take the apricots out of the fridge 30 minutes before serving, with slices of the flan.